If you have an interest in the Hotel Windham, Bellows Falls and the Vermont/New Hampshire Upper Connecticut River Valley, don't hesitate to let us know. We are the Windham Development Group, LLC and have been slowly, but surely, working to restore, replicate and further business, commerce and tourism in historic Bellows Falls, VT. In addition to its retail store space, The Windham Development Group is soliciting interest from investors to develop the more than 50 guest rooms on its 2nd and 3rd floors that are available for a variety of commercial, hospitality, condominium and/or boutique village inn ventures. Guest rooms currently include single rooms with shared bathroom facilities and a variety of multi-room suites with private baths. The spaces can be modified to suit a variety of uses. The infrastructure of the hotel building has been renovated, including new HVAC, sprinkler systems, ADA conforming lavatories. Replicated historic window sashes with energy efficient insulated glass, weather-strip and the original window hardware has been installed throughout the hotel. The hotel lobby, ballroom, sun porch and outside deck that looks out over the Connecticut River are well suited for events. And the anchor tenants on the first floor are long standing businesses. Currently, we have one 800 square foot storespace, with frontage On The Square, available for rent. Broadband Internet connectivity is readily available. Historic Bellows Falls and the Upper Valley of the Connecticut River serve as the gateway to Vermont and New Hampshire tourist attractions and All-Season Resorts. Consider just a few of the local attractions and consider the possibilities…….. 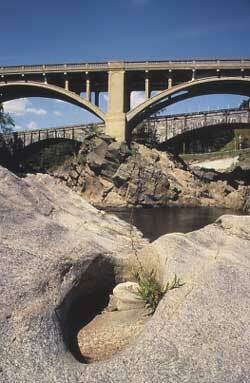 The historic Vilas and Boston and Maine bridges over The Great Falls of the Connecticut River in the dry season. The bridges connect Bellows Falls with Walpole, NH. Ancient Native American Petroglyphs on the Vermont side of The Great Falls. The elaborate cast concrete Vilas Bridge and the granite arched Boston and Maine Railroad Bridge extend from the Village of Bellows Falls, Vermont to Walpole, New Hampshire. Ancient petroglyphs, just to the left side of the bridges, as pictured above, can be viewed on the granite cliffs of the Great Falls of the Connecticut River where Native Americans gathered hundreds, if not thousands, of years ago during the annual Atlantic Salmon runs. Today, the TransCanada hydro-dam fish ladder, at the south end of the historic canal, can be watched by visitors waiting for the occasional aquatic passer-by. The historic north end of The Square in Bellows Falls during Old Home Days. The Rockingham Meeting House, also known as Old North Meeting House and First Church in Rockingham, is a historic building in Rockingham, Vermont. The Meeting House was built between 1787 and 1801 and was originally used for both Congregational church meetings as well as civic and governmental meetings. Church services ceased in 1839 but town meetings continued to be held in it until 1869. .........consider the historic Hotel Windham.